The Strike King Red Eye Shad is one mean lipless crankbait. 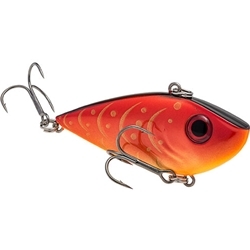 Red Eye Shad has incredible action and features some awesome paint jobs, premium hooks, 3D eyes and free floating rattles to give you the best action and sound of any lipless crankbait on the market. The Red Eye Shad has action that no other bait in its class has expecially when it free falls! It is available in many different paint schemes, from Craw to Shad patterns.